Your Product: Whose Definition is Most Important? 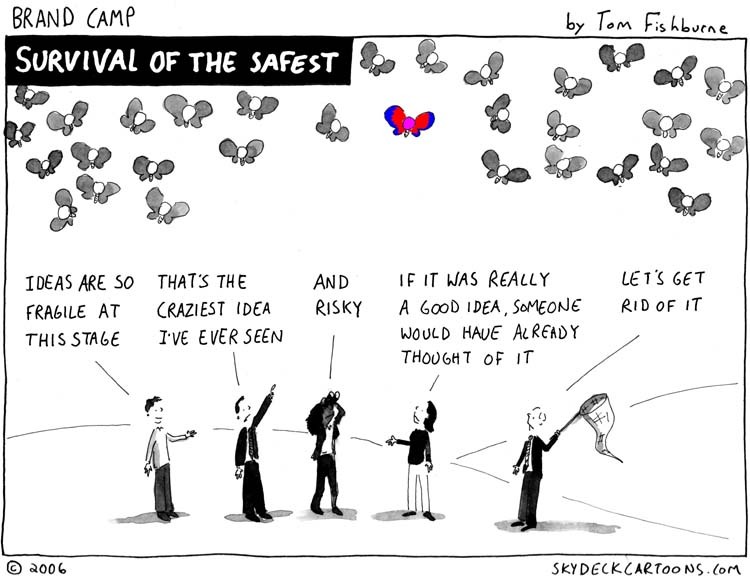 Whose definition of your product is the most important? And Tom shared his thoughts on branding, innovation, agencies, clients, word-of-mouth on my BlogTalk Radio show. Tom's one of the people you can learn a lot from: smarts, listening skills, integrity, great thoughts on branding and innovation. Check him out. 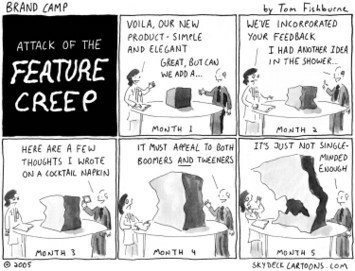 From Tom Fishburne, author of This One Time at Brand Camp. Tom shares his thoughts about branding, innovation, agencies, and some...of those times at brand camp during our conversation on BlogTalk Radio. 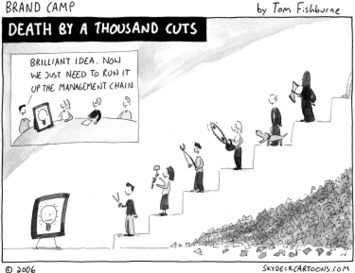 From Tom Fishburne. You can listen, streaming-mode, to our conversation on BlogTalk Radio at the link in the upper right corner of this blog until October 1. Or use this link after that date. 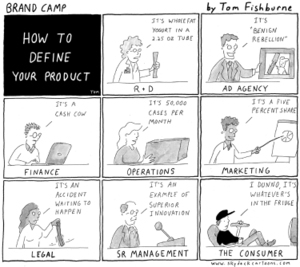 Tom Fishburne, author of This One Time At Brand Camp, will share his insights on branding, marketing, agencies, innovation, clients, customers, employees, great brands, what happens when good clients/agencies go bad (no that's just in there for fun) and what happens at Brand Camp. Tom shares a tremendous amount of wisdom and insight on the process of marketing and branding and how it all works, or doesn't, in creating a brand, a customer, a marketing plan, word-of-mouth...through the use of humor and cartoons. He started sharing his cartoons with friends and colleagues. Before he knew it, he had 10,000 people subscribing to his weekly newsletter. Join us at 9:30 AM Central, today, Wednesday, September 17 at www.blogtalkradio.com/zane-safrit. John Moore from Brand Autopsy generously shared these links and notes from his conversation with Tom. 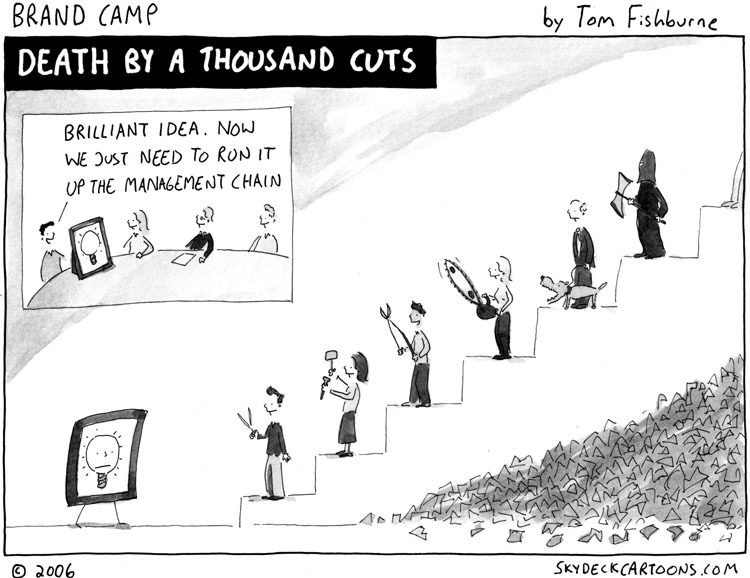 Disclaimer: Tom's gladly and quickly agreed to license his cartoons for use here on my blog. 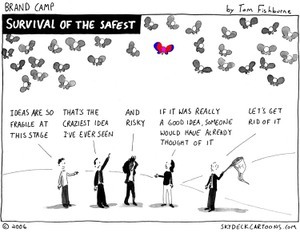 I've chosen his cartoons on Innovation. 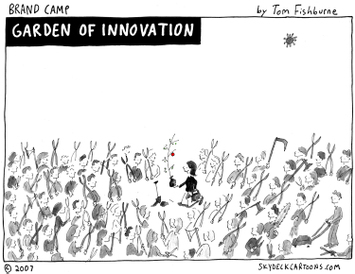 They appear each Thursday when I discuss Innovation. You can see the first 3 here , here and here. He's talking with me Wednesday, September 17 at 9:30 AM, Central, on BlogTalk Radio. You can listen live or streaming, later, at www.blogtalkradio.com/zane-safrit. 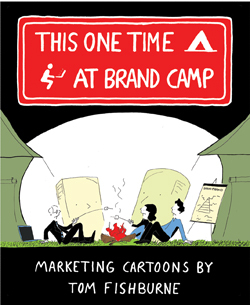 Tom's talking with me on BlogTalk Radio about his cartoons, innovation, his book titled: This One Time at BrandCamp. Our conversation is on September 17 at 9:30 AM, Central. You can listen here: www.blogtalkradio.com/zane-safrit. 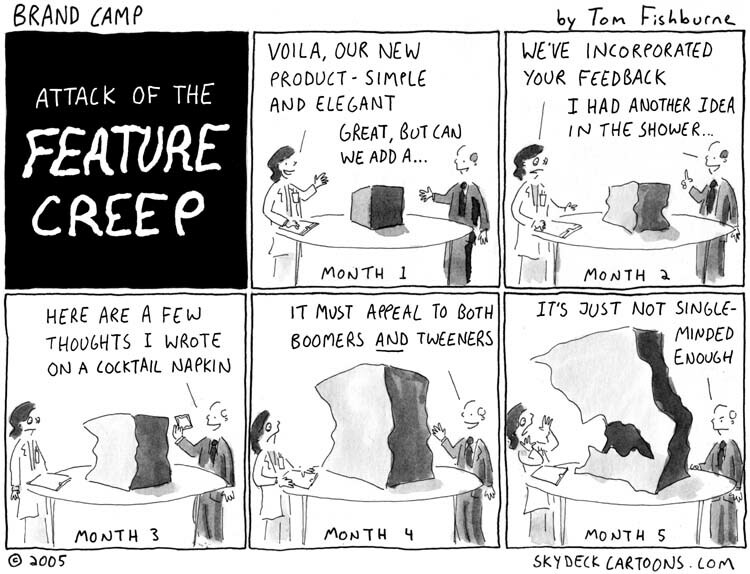 Tom Fishburne creates some funny, funny, painfully funny, yeah-I've-been-there-too funny, cartoons about business. 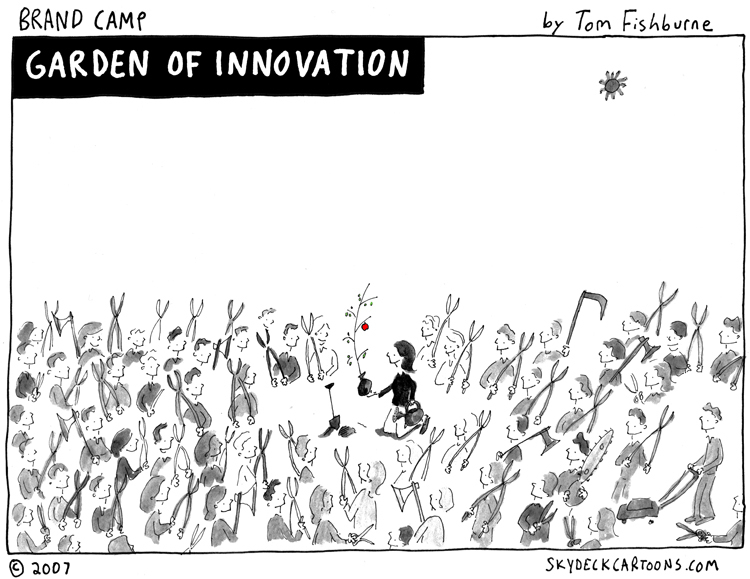 Each Thursday, I'm going to share one of his cartoons about innovation.